At this year’s Half Century of Progress show Touchstone Energy Cooperatives offered tethered balloon rides to visitors at the show. After the first group of kids and the lady that owns the Redwood log home, I was next. We waited patiently while they aired up and set up the balloon and fired her up, up and away. While we didn’t get to fly high into the sky and travel around the world like in “Around the World in 80 Days” I must say it was quite a thrill for a girl that likes to see from the tallest point. I was surprised by the amount of heat that the gas conveys. Three of us (the pilot, Jamie from the log home) and I fit tightly into the balloon after hefting ourselves over the side. It is amazing the things you can learn in a 30 minute wait. I made a friendship that may gain me a tour of Tarpon Springs, Florida when I head south for the Florida Flywheelers this February. I learned that what I thought was a weed can be used to stop a mosquito bite from itching if the leaves are crushed and put right on the bite. Most of all though I learned that if you are not in line right away don’t even think of adding a partner beside you. There was a young girl I had hoped to bring up with me and I think a woman behind me when she heard me discussing this possibility she said something akin to if I did I may end up in the hospital ER. So in the end, I had a great time and learned that even kids come in all shapes and sizes and there is no room for line cutting no matter what the age! 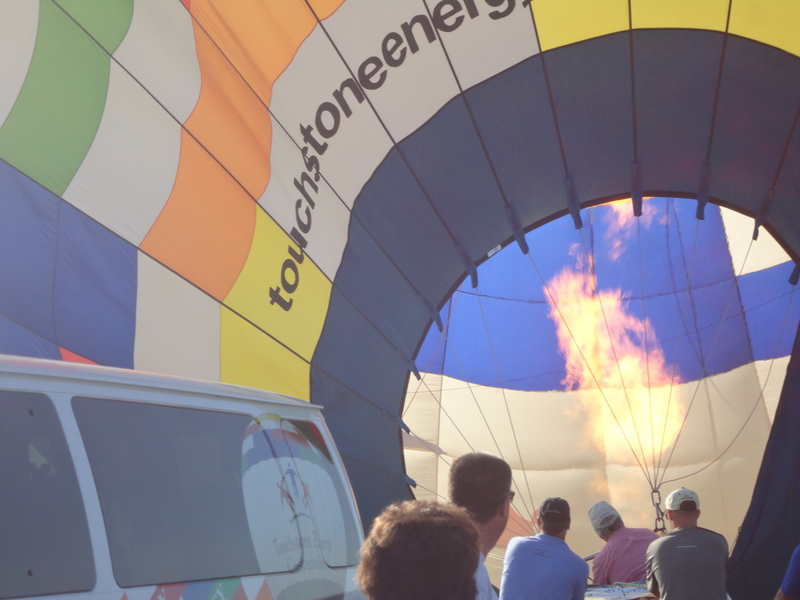 Thank you Touch Stone Energy and I hope to ride in an untethered balloon sometime soon! I’ll send it to you. 🙂 Thanks and have a blessed day!